Hot Rod Magazine - and just about every other magazine - considered 1970 as the pinnacle year for the Muscle Car. 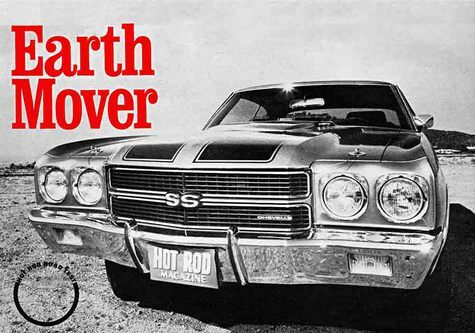 leaving Hot Rod Magazine to call it the "Earth Mover"
Glory Days! Was 1970 the Pinnacle for the Muscle Car? Maybe Not. OK, there is probably not much question about 1970 being the pinnacle in Muscle Car performance, after all, we only have to look at cars like the LS6 Chevelle pictured here to make a good argument for that. But is performance the measure of the "pinnacle" or is it something else?? To the staff here at AHPS, performance may NOT be the reason to name any year the "pinnacle". Really, from a trend point of view, the pinnacle would likely be the year in which most people selected and purchased a performance car. This is especially true when you consider that performance, until the lowered compression mandate came into play, rose each year in the muscle car era. And we should also note that cars like the Hemi, the LS-6 Chevelle and the Boss 429 Mustang were sold in such low numbers, that the average Joe or Jane not only never had a chance to buy them, but may not have even saw one on the street, in the hands of someone like them in those 4-5 years that they might have been available. So when you look closely, in 1970 or any year for that matter, so few of these killer cars were produced when compared to the Muscle Cars that regular people drove. So we need to be more specific when we consider what we are talking about when you use the word “pinnacle”? Production? Performance? Choices? Well, from a GM point of view, 1970 was likely the performance pinnacle. Why? Because the Factory finally took off the 400 cu in restriction and this opened the floodgates to likely the highest performance offerings in Buick, Chevy, Olds and Pontiac. Over at Chrysler, the only 1970 breakthrough was the offer of the astounding Hemi in the Barracuda/Challenger. At Ford, for that year, the Boss 429 was again offered. The new 429 block was now the Cobra Jet and was an available option, but it was not a huge performance leap over the 428 Cobra Jet. At AMC, the venerable 390 became a 401, and the Rebel “Machine” arrived, but that change in the Javelin and AMX resulted in very similar performance to the 68-69 390 cars. So on the basis of performance, the pinnacle of 1970 might only apply to GM cars. Chrysler and Ford cars were, in most cases, no quicker than their 68-69 brethren. And as far as new models in place, only the AMC Rebel "Machine" was a new look. In fact, few know that the 390 CID 315 HP V-8 was an available option in the 1969 AMC Rebel - a year before the Machine. However, even with these new 1970 large CID offerings, when sales figures are perused, the 1970 pinnacle theory starts to dissipate. Across the board, ALL makers had much better sales years, performance car-wise in 1968 and 1969. Everywhere you look, the numbers were better then. Truly, unless you are talking a new offering like the Hemi Cuda or the Rebel Machine, not one single brand or model sold more in 1970 than in 1968. Insurance, higher prices, perhaps even market saturation, cut the sales. And it wasn't for lack of advertising - more ads dominated the magazines and newspapers in 1970 than previously. So when you slice it and dice it, if you are talking popularity and production, the pinnacle year for putting muscle cars in the hands of the enthusiast was 1968, not 1970. Why we see 1970 as the pinnacle is that after this year, muscle cars - and raw US auto performance - started to decline in both sales and stop light acceleration. 1970 might better be thought of as "the beginning of the end" than the pinnacle. Scary to think that in two years after 1970, by 1973, the muscle car basically ceased to exist. The Hemi was gone, the GTO was a 350 CID Pontiac Ventura, not to return until the 21st Century, Buick move the GS Stage 1 into the Riviera, Ford made their performance engine the 351 Cleveland, and over at AMC the hot setup was the 360. So when we talk "pinnacle" we should more talk about the 1964-1972 period as the benchmark - not one single year. In that time astounding performance was available to everyone - not just factory sponsored racers or a few people who could afford a 421 Pontiac or a Chrysler 300 letter car. Not even now, where we have performance available to many was there cars that were affordable and available to anyone who had reasonable income. Think that now a Mustang GT 5.0 or a Hemi Challenger or a Camaro with LS power costs close to forty large - not in the sweet spot of the young performance enthusiast. Back in the pinnacle period, just about anyone could have an exciting ride - that's what made it the pinnacle. AMC's Rebel "Machine" was late to the muscle car scene, but it could hold its own. This image from the 1970 Chevelle SS handout pretty much says it all with out saying anything. Chargers came in a ton of performance flavors, but tipping the list was the famous Hemi and the 440 "six-pack". Ford touted their new 429 CJ in the Torino - and rightly they should have - it was no slouch. Mercury's Cyclone GT with the 429 CJ could run just as hard as the Torino. Plymouth's GTX was the upscale muscle and with 440-6 and Hemi power (plus the air grabber hood shown) was super strong! Judge or straight GTO - all could be had with the RA (Ram Air) IV 400 or the 455 HO.